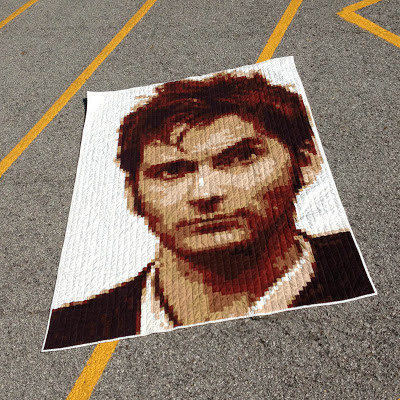 So, here I am once more talking about my pixelated Doctor Who quilt, The Tenth. I'll share with you photos and information about the quilty party later; but I want to start with the event at the St. Louis Science Center last night. As I mentioned in my last post, I was honored to be a part of the festivities and my quilt was given a prime location next to the OMNIMAX theater entrance. I could not have imagined the outpouring of excitement and pure joy that spread across so many faces; and mine was definitely the largest grin of them all. You hear about Comic-Con in San Diego, see photos and read stories online about how devoted people are to their particular "fandom"; whether it's Star Wars, Star Trek, Doctor Who, Lord of the Rings, or a combination of any and all of the hundreds of things you can love...but to experience it in real life is truly something magical. If you haven't seen or heard Wil Wheaton's speech on "Why It's Awesome To Be A Nerd", I highly recommend checking it out. 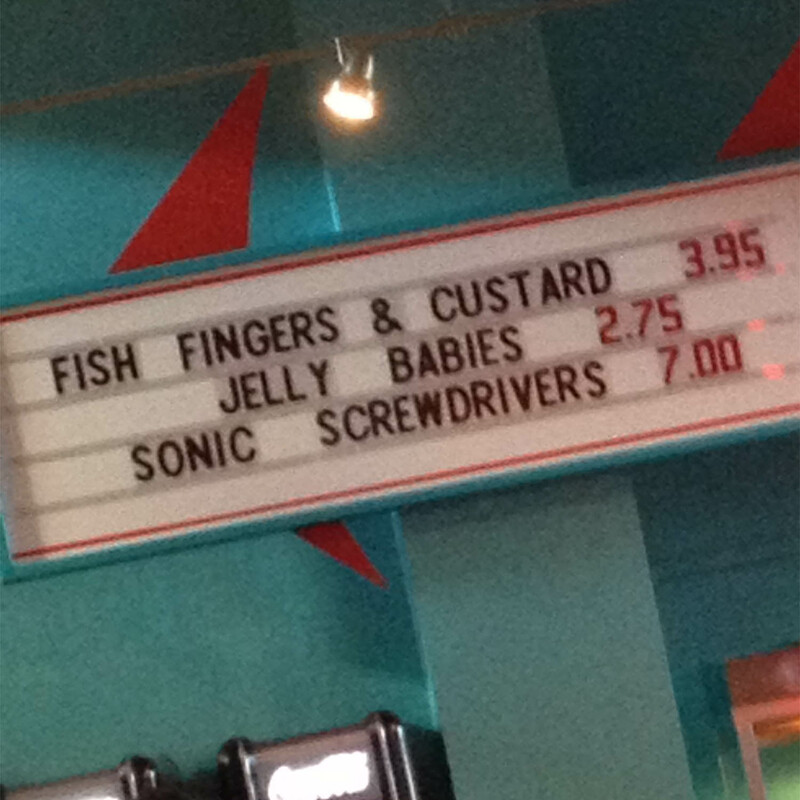 The Science Center even got in on the fun and offered some Doctor Who related treats. Before the event officially started, people were crowding around asking me questions, taking photos and having a ball. I was astounded when lines formed, filled with people wanting to have their photo taken next to the quilt. Now, obviously I'm not stupid...it wasn't necessarily the quilt that interested them; but the fact that it was an 8ft tall picture of David Tennant; which made a once in a lifetime back-drop. Updated 7/12/13: The Science Center talks about the overwhelming response to their event, and they mention my quilt. Regardless of what brought them over, this journey has helped me to understand something that most probably figure out at a much younger age. 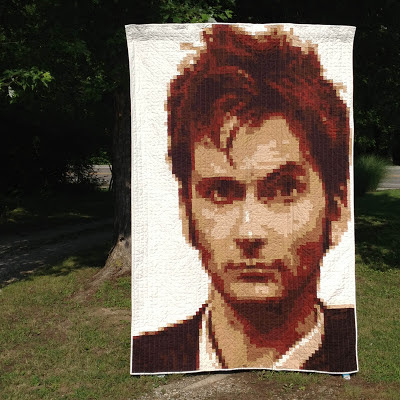 I don't have to feel "awkward" about loving what I do; whether it's making quilts, geeking out with others over Doctor Who, or any of the other things that make Me....Me. Now onto the quilty part of this post. If you recall, I have been struggling for months with how NOT to ruin things, as I know that my machine-quilting skills could not compare to the time and attention that I put into piecing the top. After asking my St. Louis MQG for advise, and gathering some wonderful insight from Elizabeth Hartman; I felt a little more comfortable. I whipped up a sample and posted it to Instagram asking about thread colors, after which I dropped the white in favor of a light beige. Thanks to those who suggested it. 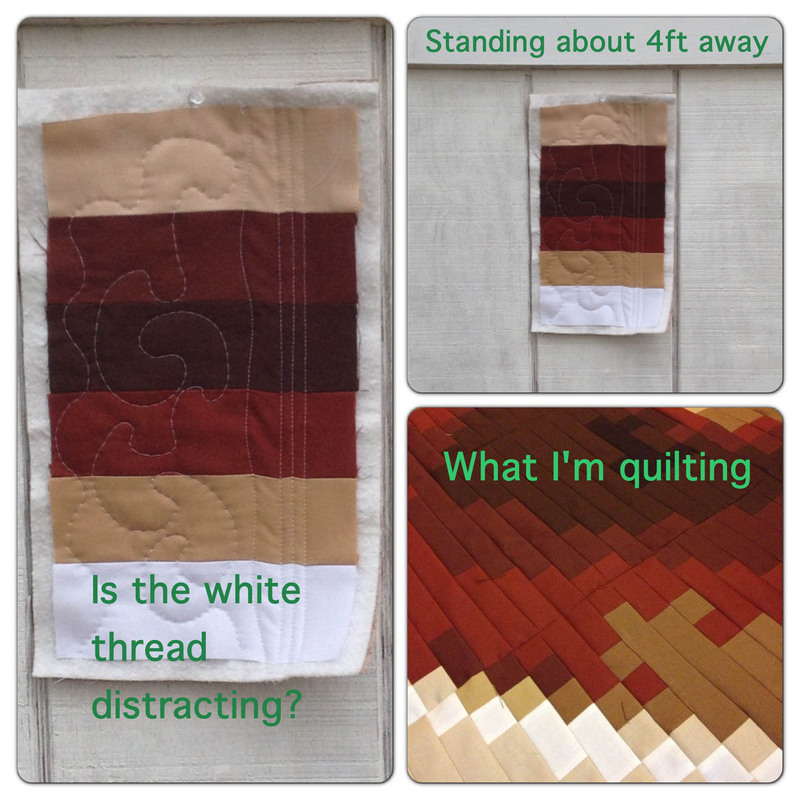 I chose to quilt parallel vertical straight lines 1 1/2" apart; which helped to reinforce the pixel-nature of the quilt. It took 4 bobbins and about 7 hours of work, split between 2 days to finish. My Mom was kind enough to hand-sew the binding earlier this week. And on Wednesday, I washed it and sewed the sleeve on the back. My Dad helped me take some photos on the 4th of July. This quilt's journey continues as I'll be mailing it off to England next week; where it will hang in the Festival of Quilts show, August 8th thru the 11th. After that...who knows???? If you missed any of my posts about this quilt, check out the links below. Wanna know a secret, I'm itchin' to do it all over again; yet maybe in the fall. I have some pressing To-Do's on my list as well as other things I'd like to try. Yes, I already have a few ideas of whom/what I'd pixelate next; but telling you would spoil the fun. Great post, Kristy. 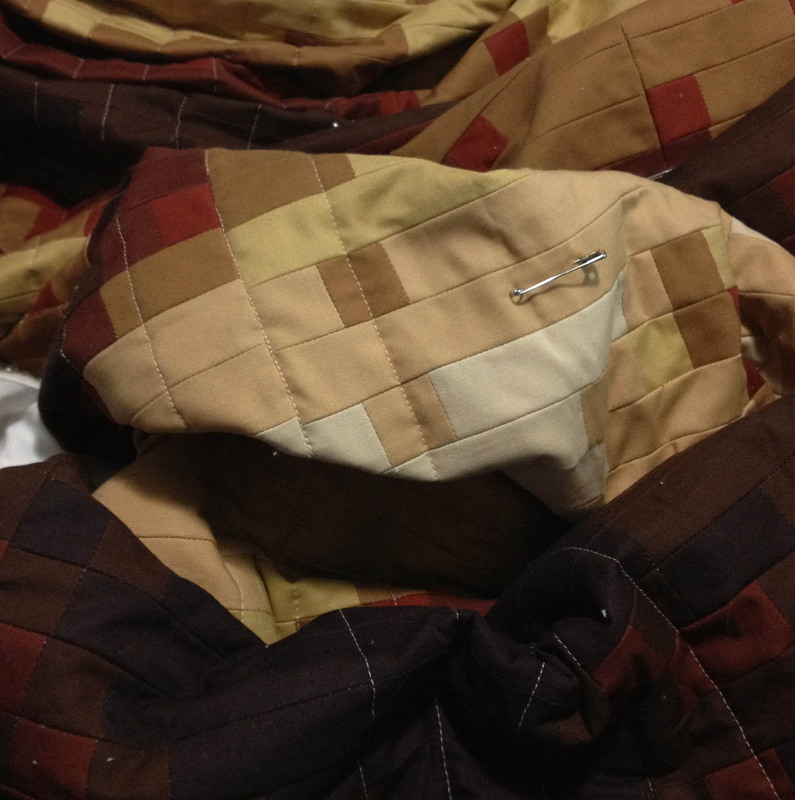 Very excited for you and I'm sure the attention your quilt is getting is so gratifying after all your hard work on it! It looks fantastic! Hope you never feel awkward again about being you. We love you and all the amazing things that you do! Kristy, I don't know how you can bear to part with it! Looks SO great! Congratulations. So glad you had fun on Friday! I am having a ball reading your posts about this quilt. It's garnering quite a bit of attention (as it - and YOU - should)! Keep sharing, please. 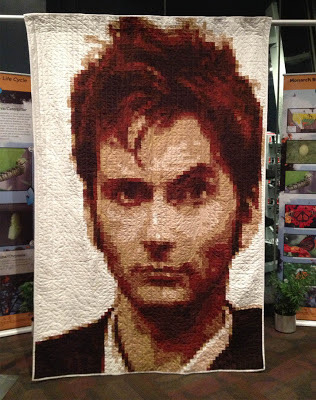 This quilt is amazing!! As I just started following you, this is my first time seeing it and you did a fabulous job. I have been to the St. Louis Science Center so I understand what a big deal that is. Congrats!! You deserve all the hoopla you can generate!!!! Fab job! Kristy, you are simply amazing. I am thrilled that your quilt was the hit of the show! You deserve every accolade and fangirl/guy supersonic squeeee!! for making such an epic piece of art! The quilt is amazing, you are amazing! Congratulations on being the hit of the show! Well done! Great work at pixeling as well! Thank you for sharing. So fantastic! I feel like I was there witnessing all the geeks discovering you fabulous quilt. Congrats! I'm sure it'll be a huge hit across the pond! Kristy, congratulations on your fabulous finish. I'm so impressed with and very excited for you to get the attention that you deserve!! Your work is amazing, truly. That is an incredible quilt! No wonder people wanted photos with it!